Dudley the duck had lost one of his feet after an attack with feisty chickens but now he is being fitted with a 3D printed leg. The 3D printed leg is a movable, plastic webbed leg to help Dudley move just as any normal duck. When Dudley and his brother were born, they were placed in a cage with chickens at K9-1-1 Animal and Rescue Services in Sicamous, British Columbia. One day, the chickens turned aggressive and attacked the ducks. Dudley’s brother died and Dudley lost his foot and part of his leg. Although Dudley can still swim, he has trouble getting around on land. Terence Loring, a mechanical engineer who recently started a 3D modeling company called 3 Pillar Designs, heard about Dudley through a friend. 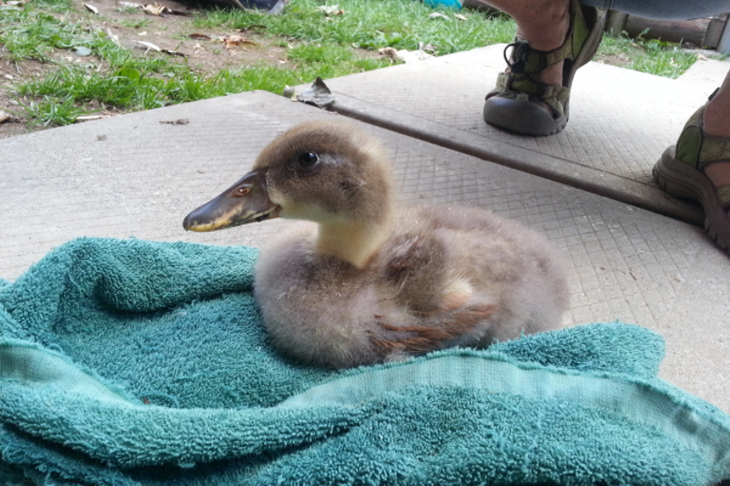 Loring visited Dudley and then created a prosthetic leg for the duckling. The project was called “Project Robo-Duck.” Dudley’s measurements were taken and Loring designed the leg in SolidWorks 3D modeling software. Proto3000, a local 3D printing service, printed the prosthetic leg free of charge. The first 3D printed leg was a mirror of Dudley’s other foot and was at a wrong angle. Loring went back to the drawing board. The second design was much simpler, consisting of consisting of an upper-leg, lower-leg, and connecting pins for the joints. The printed leg is made of Strong ABS plastic. The foot is made of a soft and flexible rubber-like plastic so that Dudley can walk more easily.